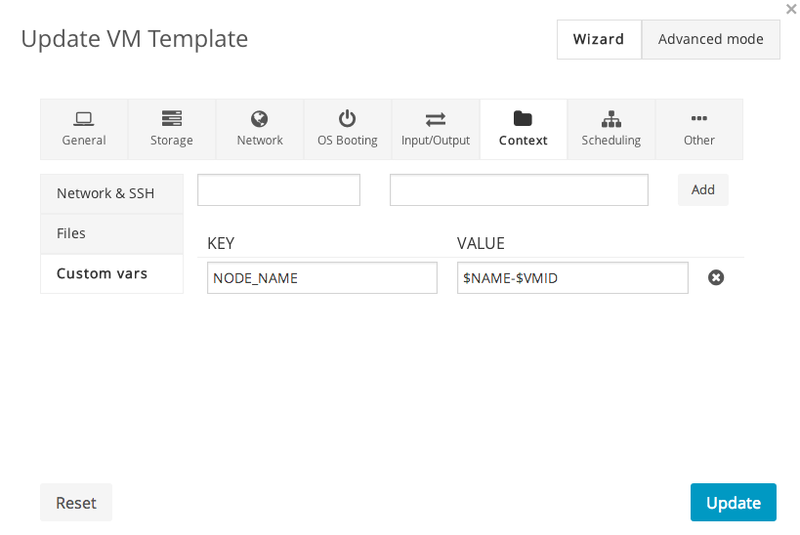 OpenNebula contextualization is a system that writes VM configuration parameters into a CDROM image and a package installed in the VMs that is able to configure the system using this data. By default comes with scripts to set the network configuration (IP, DNS), hostname, allowed ssh keys, etc. You can even easily create your own version of the packages with new scripts that configure other parts of the system as stated in the documentation. Still, if you don’t want to create you own context packages you can specify scripts to be started at boot time. 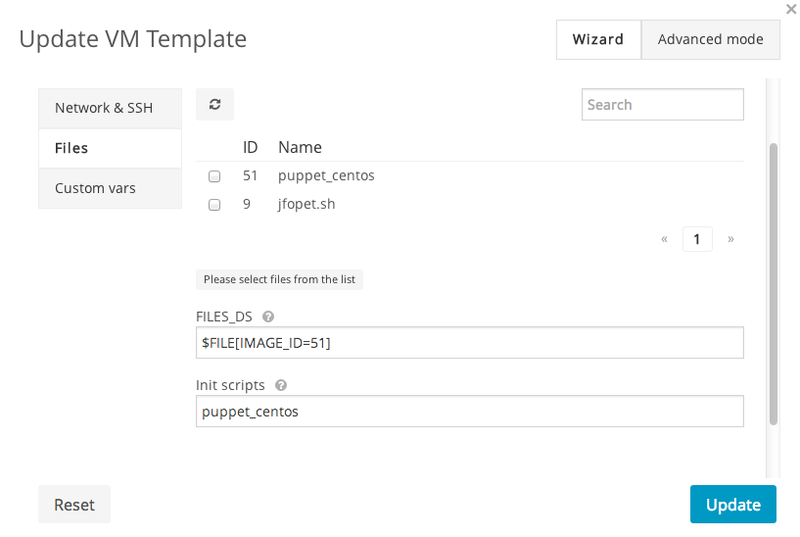 In this post we will provide an example on how to use this system to prepare the machine to be configured with Puppet but these tips are useful for any other CMS. In case you are not using autosign you should use the puppet cert command to sign new host certificates and wait until the Puppet agent in those nodes wakes up again. By default they do it every 30 minutes. Make sure you change Puppet master IP and name. add a new variable called NODE_NAME set to $NAME-$VMID. 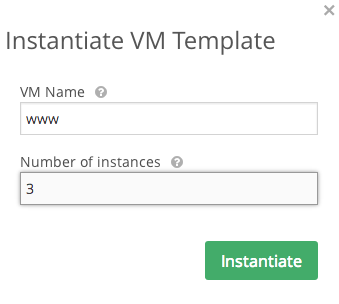 This way the node name for the VM will be the same as the OpenNebula VM name. Now we have most of the bits needed to do the automatic configuration of the VMs after boot. It is only needed to add configuration to the nodes. Now when instantiating the template we can provide the name www. OpenNebula will add the VM ID to the certname so we will have www-15, www-16 and www-17, for example. All these node names will match the regular expression and install apache. Excellent post! We do something very similar in our environment, utilizing the init scripts for deploying puppet, then defined manifests for pushing the configurations down. Works great for nearly hands-off configuration of your entire environment (so long as your Puppet code is well-written. ;-p ). A problem you’ll have doing this is that if you resubmit/recreate a VM with the same name, the certificate will still exist on the puppetmaster, but won’t match the host cert. As such, puppet will fail with a big pink ‘bad cert’ message. Then we use CURL to call out to the puppet API to remove the cert .. we do this as part of the puppet context script, as well as part of automation (shutdown automation, etc). Bill Campbell: Sure, the hard part here is the configuration. Todd: Thanks for the tip! I didn’t have that problem but also I didn’t start that many VMs.